Jimmy Carter's Guess: Egypt's Mubarak 'Will Have To Leave' : It's All Politics Carter also said he knows and likes Omar Suleiman, Mubarak's hand-chosen vice president. He described Suleiman as intelligent. The former president described the current crisis in Egypt as the most profound in the Middle East since he left office. Former US President Jimmy Carter, in east Jerusalem in October 2010. Few U.S. presidents know the Middle East or Egypt as well, nor have come by their knowledge of the region as painfully, as Jimmy Carter. So it's worth noting that Carter on Sunday said his "guess is Mubarak will have to leave," speaking of embattled Egyptian President Hosni Mubarak. 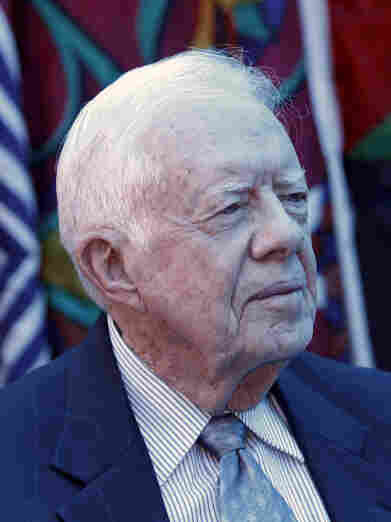 The 86-year old Carter made his comments at Maranatha Baptist Church in his hometown of Plains, Ga., according to the Ledger-Inquirer news website of the Columbus, Ga newspaper. Carter is the nation's most famous Sunday school teacher, having led classes at the church since before his presidency. "This is the most profound situation in the Middle East since I left office," Carter said Sunday to the nearly 300 people packed into the small sanctuary about a half mile from downtown Plains. Carter spent the first 15 minutes of his 50-minute class talking about Egypt. For Carter to describe the Egyptian crisis as the "most profound" in the Middle East since he was in the White House is saying something given the effect of the Iraq War not only on the region, removing a counterweight to Iranian influence. "He's an intelligent man whom I like very much," Carter said. Carter has maintained a relationship with Suleiman over the years. "In the last four or five years when I go to Egypt, I don't go to talk to Mubarak, who talks like a politician," Carter said. "If I want to know what is going on in the Middle East, I talk to Suleiman. And as far as I know, he has always told me the truth." Besides agreeing to not take up arms against each other, Israel also agreed to withdraw its troops and return to Egypt the Sinai Peninsula it had taken during the Six Day War in 1967. As has often been mentioned in recent days, it was also Carter who watched fairly helplessly as the Iranian Revolution in 1979 wound up with the Shah Reza Pahlavi, the U.S.'s strongman ally, being chased from Iran, the installation of a theocracy led by Ayatollah Khomeini and the U.S. embassy hostage crisis.